Saturday March 2 1910 I did not feel well. I did some baking in the forenoon and went to town with Willa t 1.12. I saw Dr Smith got some medicine and did a few errands so I came home at 2.30. I rested till time to get supper and read in the evening. 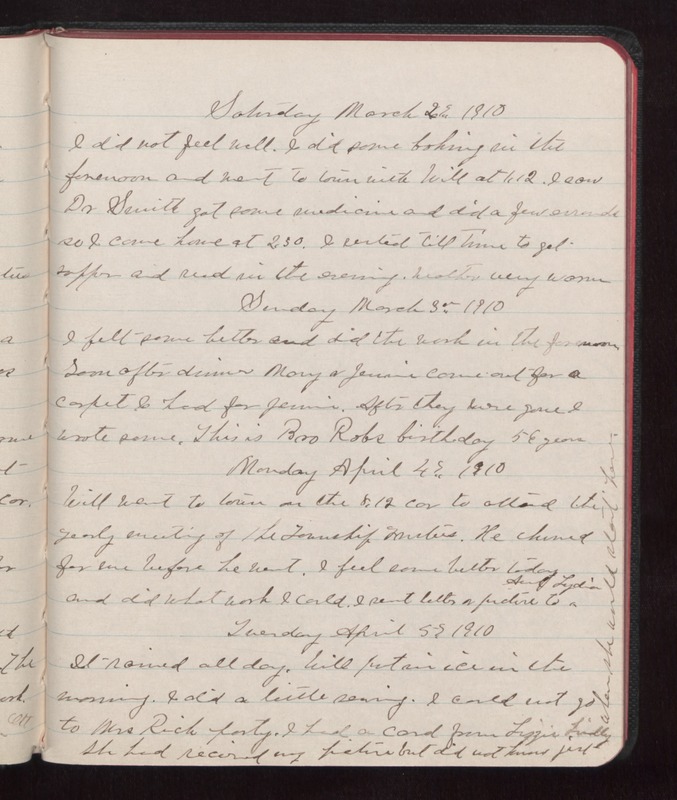 Weather very warm Sunday March 3 1910 I felt some better and did the work in the forenoon. Soon after dinner Mary & [Jeunie?] came out for a carpet I had for [Jeunie?]. After they were gone I wrote some. This is is Bro Robs birth-day 56 years Monday April 4 1910 Will went to town on the 5.12 car to attend the yearly meeting of The Township [illegible]. He churned for me before he went. I feel some better today and did what work I could. I sent letters & picture to Aunt Lydia Tuesday April 5 1910 It rained all day. Will put in ice in the morning. I did a little sewing. I could not go to Mrs Rich party. I had a card from Lizzie Lindley She had received my picture but did not know just when she would start here.